In November last year, we were fortunate enough to hear from the amazing Tania Noakes who approached us with one of the craziest of challenges we had heard of yet. Tania had a mission to complete the “Norge På Langs” which is roughly translated from Norwegian as “Norway from end to end”. 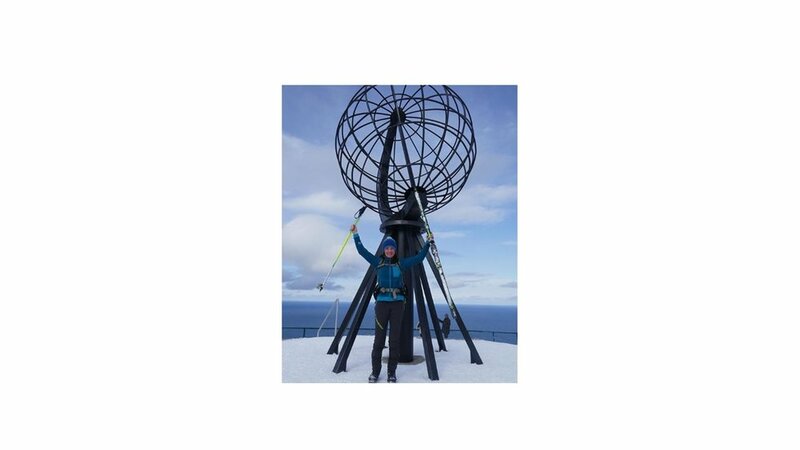 The journey is approximately 2500km extending from Lindesnes the most southerly tip of Norway to Nordkapp in the extreme north and Tania wanted to be the first British woman to complete it solo in a single winter. We were so intrigued to hear what makes someone want to undertake such a feat? (Part 1 here) However, now Tania is back with the mission conquered! After taking some time to truly reflect and narrow such a vast trip into a few paragraphs. Here is little flavour of Tania's tale. Sitting in the sunshine outside my apartment in Chamonix feels a world away from the endless snowy landscapes I journeyed through this winter. I can stretch out my legs and wriggle my toes; savouring the suns warmth on my skin and the return of summers freedom. My dream to journey on skis from one end of Norway to the other, to experience “Norge på langs” has become real. What was intense and vivid for a time now settles into memory and I can feel the seductive pull of sadness at something once lived that begins to recede with the passage of time. But when I close my eyes, I can return to a world of frost lined eyelashes and cold burning cheeks; where I’m wrapped up tight against the fierce cold and skiing alone from dawn to dusk. At times I battled fierce winds, deep snow and fatigue, at others navigated in poor visibility to reach the next shelter before darkness fell. I still remember the feeling of my chest so tight with emotion that it leaked out in humble, happy tears; grateful simply for being alive and able to experience such a magical journey. Although I was alone with my thoughts I never felt lonely, and despite being unsure as to whether I would ever reach my goal I was content to be on the right path. It took me 82 days and 2533km to ski from Lindesnes to Nordkapp along a route that weaved through some of the most remote mountains and valleys of Norway. Every day brought some unique new experience or encounter and taken as a whole the journey is one of the most satisfying and rewarding experiences of my life. When I set out from Lindesnes lighthouse, despite my planning and preparation I was far from certain that I would ever reach my destination. There was no way of knowing in advance what the winter season would bring in terms of snow and weather conditions. Though I felt physically prepared, I knew that even a small injury could prevent me from continuing. I focused on making the best decisions from moment to moment, concerning my capacities and the prevailing conditions. My strategy was to travel as far as I could when the weather was good and be prepared to take a rest day in poor conditions. More than any other time in my life I was able to live one day at a time and I was rewarded with the simple satisfaction brought by living wholly in the present. When I look back on my journey I feel fortunate in many ways. I am fortunate to live in a time and place where taking on such a challenge is possible, fortunate to have the strength and skills to make it happen. I am grateful to the companies who were inspired by my project, added fire to my enthusiasm and supported me materially. I also recognise that this winter had near perfect conditions for such a traverse. Compared to recent years there was more snow, particularly in the south and early on in the season. More importantly the temperatures stayed consistently cold, preserving the condition of the snow through to early April. Over the course of my journey I had to ski across hundreds of frozen lakes and yet I rarely had concerns about breaking through the ice because it was so cold. For a solo skier this had the potential to be a serious risk. This winter Norway was battered by remarkably few westerly storm systems and as a result I rarely had to face storm force winds. The prevailing air system stayed largely from the east (Siberia), which was why there was such a prolonged period of low temperatures. I was able to start skiing on the third day of my journey and stayed on skis all the way to Nordkapp. Of the 2533km I only had to walk about 2%. For the most part the snow conditions allowed steady progress, despite tiring trail breaking. Snow can be impossibly difficult to make progress through, under certain conditions, as I found out north of Abisko. But despite minor setbacks and frustrations there was always another way through, and with the help of friends and a positive attitude I was always able to find it. Perhaps it is unsurprising that I should arrive at the end of such a journey feeling somewhat philosophical. In the constant clamour of day to day life we don’t always have time and space for much reflection. One thing I take pride in is that despite many hours alone, at times in difficult and uncertain conditions I was always able to focus on something positive, and I honestly say that I enjoyed the lows as well as the highs. Since returning from Norway the breathing space that I created in my life so that it could happen has disappeared. Like a fragile bubble that has burst, collapsing that precious space and returning the reactive struggle of daily life. But those moments of clear contentment out on my skis in Norway have ossified into something firm and solid inside; a determination to fight to keep things simple; to be clear about my priorities and keep space for them, accepting that the remaining decorations of life will fall as they may.